With Live performances by Kiran Dhanoa of Rishi Rish & tribal belly dancer Misty J. Judges include Big Brother’s Deana Uppal, Cameron Khan, Menswear & accessories designer Ziggi, online magazine Desiblitz, Blaise Media & the current winner of Face of Sharons Couture - Sofia Zolghadriha. 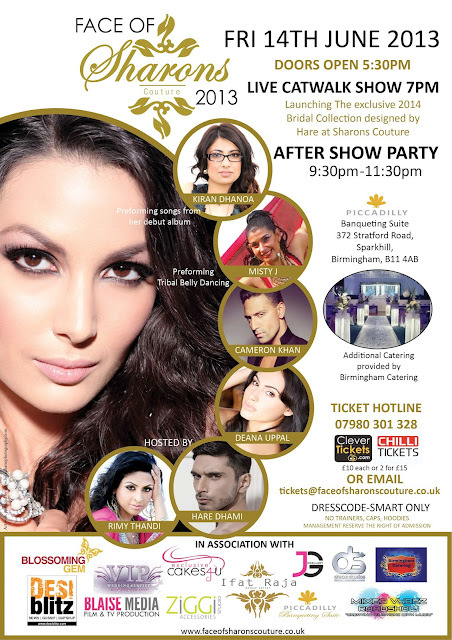 Catwalk hosted by Haré Dhami & Brit Asia TV's Rimy Thandi. Hair & make up provided by Ifat Raja – the official catwalk creative team & jewellery by JG Jewellery. Food catering provided by Birmingham Catering, Cakes by Exclusive Cake 4 U, stage décor by VIP Wedding & the Official DJ & Dhol Players from Mixed Vybez Roadshow. Tickets are priced at £10 each or 2 for £15, please contact on 07980 301 328 or email tickets@faceofsharonscouture.co.uk for further details. We look forward to seeing you at Birmingham's most eagerly awaited event.